Co. Kildare: Ballysax, Bodenstown, Carnalway, Carragh, Clane, Downings, Gilltown, Kilcullen, Kildare (2), Kill, Killashee, Kilmeague (2), Moorfield, Naas (3), Newbridge, Old Connell, Rathernan, Rathmore, Timahoe, Usk. Co. Dublin: Ballymore Eustace (2). The Board also included 10 ex-officio Guardians, making a total of 40. The Guardians met each week on Wednesday. The population falling within the Union at the 1831 census had been 50,512 with Divisions ranging in size from Bodenstown (population 1,013) to Naas itself (6,116). 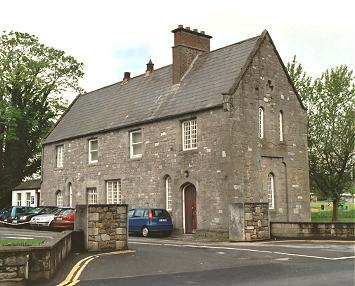 The new Naas Union workhouse was erected in 1840-41 on a five-acre site half a mile to the south of Naas, at the south side of Craddockstown Road. Designed by the Poor Law Commissioners' architect George Wilkinson, the building was based on one of his standard plans to accommodate 550 inmates. Its construction cost £5,550 plus £950 for fittings etc. The site location and layout are shown on the 1911 OS map below. The workhouse was declared fit for the reception of paupers on 15th June, 1841, and received its first admissions on 4th August. During the famine in the mid-1840s, a house was hired to accommodate an additional 100 inmates, and a stable fitted out to accommodate a further 50. A fever hospital accommodating 44 patients was erected at the south of the workhouse. The main buildings followed the typical layout with an administrative and children's block at the north, containing the board room, porter's room and waiting room at the centre, with children's accommodation at each side. To its rear, the main accommodation block had the Master's quarters at the centre, with male and female wings to each side. A central spine containing the chapel and dining-hall linked to the original infirmary. The 1911 map shows a hospital located at the north, apparently in the administrative block. The workhouse also had a gate lodge at the north of the site. This may have been a later addition relocating the board room, porter's room etc. from the original administrative block. 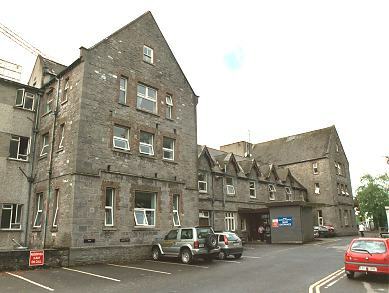 The site, now much developed with modern buildings, is the home of the Naas General Hospital. Kildare County Library, Riverbank Campus, Main Street, Newbridge, Co. Kildare. Holdings include Board of Guardians' minutes (1841-1922) etc.